Part of my Client Maintenance Program includes a membership to DocuBank. Be sure to carry your DocuBank Emergency Access Card in your wallet — next to your driver’s license or health insurance card — at all times. You should also periodically update your emergency contact and medical information stored with DocuBank. To do so, see the box to the right. You will need your member number, PIN and personal password (default set to your zip code). 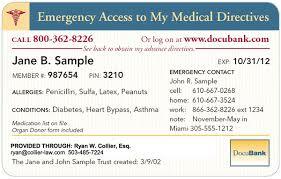 This video shows you how to make a list of your medications available to doctors using your DocuBank Emergency Card. You can create a list of your medications on the DocuBank website, or you can upload a list you’ve prepared. Share Certain Document with others. Digital Executor, Access to others after death. This identification card provides a way for medical providers to obtain your key medical conditions, allergies, contact information and your Advance Directives in one place.